Sweet Cheeks Adventures: Van's Waffles and Joy Bauer's Cookbooks! Van's Waffles and Joy Bauer's Cookbooks! 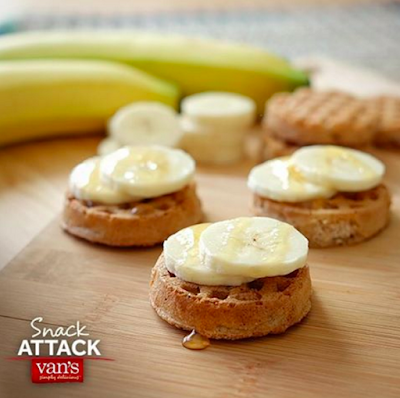 It's Back to School time and Van's has your breakfast covered! We like to start our day with delicious waffles, pancakes and other great Van's products, so I thought it would be great to share this giveaway with you. We could eat waffles for breakfast, snack and dinner. Big fans around here, so take a look at this Snack Attack! Bananas, waffles and syrup. Absolute yumm! We tried this combination as a snack on Cooper's first day of Pre-Kindergarten and he loved it! No doubt this snack will make the rounds as the kids get settled back into the routine of school. One part of Back to School that I personally enjoy is all of the pumpkin that turns up! 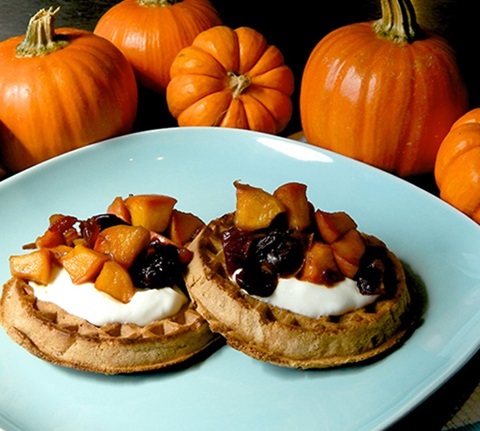 I can't wait to give these delicious waffles a try while adding in a little pumpkin love. I could eat pumpkin year round, so I have to get my fill. Simply amazing! To celebrate modern moms and make their mornings a little easier, Van’s is hosting a Back-to-School giveaway for a year’s worth of free waffles (52 coupons) and three signed cookbooks from celebrity nutritionist and best-selling author Joy Bauer. Sweet Cheeks Adventures is not responsible for prize fulfillment. We were given coupons in exchange of opinions and promotion of this giveaway. Van's is facilitating this giveaway.